An organic movement of traffic can be quite useful, but finding the right balance is key. If you’ve ever been to Italy, and ventured into the beautiful city of Rome toward the end of the year, you may have noticed a stunning natural event in the skies above. Literally millions of starlings swirl and dance across the city, creating organic shapes and a twisting, folding black cloud of birds. 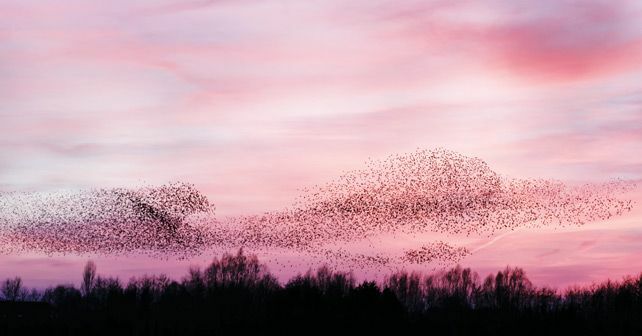 The phenomenon is known as murmuration, and other flocks of birds across the globe do a similar dance. It is truly spectacular, but something similar happens right here on the ground in some cities. While just about every country has road rules, some are more rigidly enforced than others. Rather than relying on common sense and common courtesy, there are some cities that clamp down on any variation of driving style to suit either the weather or traffic conditions. However, for those that are a bit more lenient, some spectacular driving and movement is on display. While not quite a full-blown murmuration, watching scooters and motorbikes weave in and out of traffic, without clipping a mirror or a kerb, you can’t help but think of a flock of birds swirling through, evading obstacles and keeping in constant movement. There’s a certain beauty to traffic flow that is unhindered by rules. Being able to slip in and out, left and right, around cars that can’t move anyway, and trucks that impair vision for some distance, is a blessing, and in the vast majority of cases doesn’t create any issues. In fact, it shows a level of skill that is severely lacking in some Western countries. In punitive societies, such as Australia, New Zealand, Switzerland and, to a lesser extent, the United States, there isn’t the freedom to bend the rules a little to allow traffic flow to continue. As a result, scooter and motorbike sales in those countries are way down on their Asian counterparts. This also has consequences that most people don’t think about. A car stuck in a traffic jam is a car burning fuel for no reason. Let’s be honest – the air-conditioning is always on in most cars. And if the weather is warm, it’s going full bore. Typical start-stop systems aren’t going to be that effective in these situations (and most vehicles don’t have them anyway), so there are hundreds of thousands of four-cylinder engines pumping out harmful emissions for no real purpose other than to be one giant air-con compressor. Meanwhile, in places where these little buzz-bikes are popular, they’re threading their way through the streets, zipping in and out and making plenty of forward progress. And using far less fuel in the process. You see, a one-cylinder, 100cc scooter is very efficient in ferrying people around the place. And if there’s that much traffic, you’re never going to move that fast anyway. While I enjoy seeing the organic movement of hundreds of scooters through traffic and I love the whole idea that humans can have a murmuration of their own, there are certain limits that need to be put on this traffic dance. And they’re more for safety’s sake than anything else. Firstly, no nine-year-old boy should be riding with his little sister and little brother on a scooter – they simply don’t have the thinking ability to comprehend the outcomes of certain situations. It’s a recipe for disaster. So, the strict enforcement of a minimum age is a must. Police can’t turn a blind eye to this. Secondly, helmets (as much of a pain as they may be) should be worn at all times. Even for a two-minute trip down the road. Again, lives are at risk here. But if you can split the lane with two or three vehicles, then there shouldn’t be an issue. Provided, of course, that everyone is using their mirrors. And that’s where the Asian countries have it over their Western counterparts. They know how to look around, know exactly where the edge of their vehicle is and they don’t flare up in a rage if someone squeezes in front of them. A bit of courtesy, a bit of patience, and good dose of manners makes a big difference when we’re all sharing the roads. We still need road rules, of course, but a certain bending of some of them can work out to everyone’s benefit. Finding the right balance, however, is the key.